Hey, kids, who wants a Zim Bear? Bobbleheads are a fine giveaway, a nice little gift, if you're one of those people with a basement full of dusty ceramic heads, praying for a retweet by @LunchBoxHero45. In other words, get a life. Bobbleheads have gotten annoying. They break within days. Their cardboard boxes litter baseball stadiums on giveaway day. Kids fight over them. They're all made in China by kids, and I wouldn't want to test the paint. 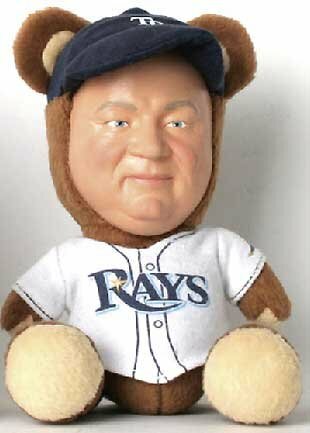 Bobbleheads made a solid run for, oh, 50 years, and there was simply no way to advance the promotional idea -- until this! Say hello to Zim, a creepy Don Zimmer-fied bear to be given away by the Tampa Bay Rays on June 29 against the Detroit Tigers. Mercy. We decided NBA veteran Matt Bonner, who lives outside of San Antonio, needs a ranch. Doesn't he? Come on, Red Rocket, buy a ranch. Tim Duncan must have a ranch. "Nobody has a ranch. That’s something to have if you’re from Texas, like Josh Beckett. He has a ranch," Bonner said on our radio show this week. "Who wants to take care of a ranch?" You hire people for that. "Yeah, but then you have to watch them. It all seems like a big headache to me. No, thanks. I’m from New Hampshire, where we grow up shoveling and raking. That’s enough. I don’t need to be shoveling livestock manure."